Canyon coolers are not as popular as cooler brands like the Yeti, Pelican, Orca Etc. If you are not much into coolers, chances are you’ve never come across canyon coolers. While canyon is unpopular, it’s a name you’ll have to get used to soon. Thanks to the rotomolded construction, affordable price, extended ice retention and overall value it provides, the canyon is a high-end cooler worth checking out. 1.2 Is The Ice Retention The Same? 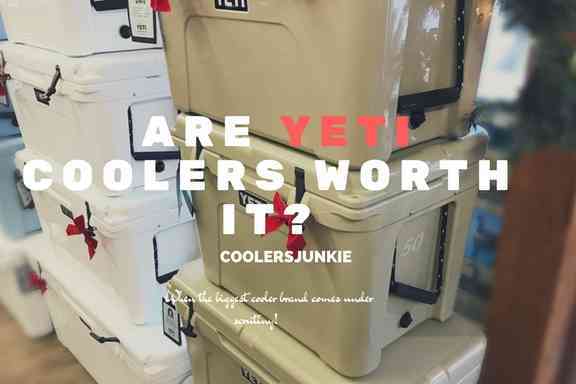 2 Canyon Coolers vs. Yeti – which is better? 2.7 Where are Canyon Coolers Made? Some features canyon possess makes it one of the best coolers for the money. Rest assured with less money; you can secure a premium ice chest. Practically Rotomolded Ice Boxes are the most robust coolers and tend to have more ice retention time than regular coolers. 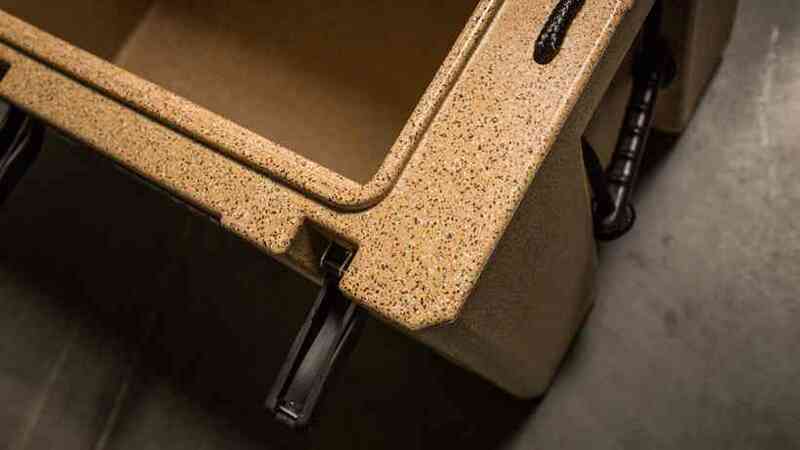 Following the same path as the top cooler brands, canyon utilize a Rotomolded PE construction. The result is a 2.7 inches wall that adds to the insulation for longer ice times. The outfitter model (Canyon Popular model) is designed with recessed features, and it makes it easy to stow the cooler at the back of your car without the latches or handles getting in the way. Additionally, the cooler features a UV resistant polyethylene construction, meaning it’s suitable for marine purposes. As it can reflect all the harmful rays of the sun. The canyon is rugged and durable; sure it will stand abuse even after a long time of use. If you are looking for a cooler designed for outdoor activities, then look no further. Nothing beats the feeling of having a certified grizzly bear resistant cooler when camping. You can put your mind to rest no grizzly will break into your ice chest. We all have our worries when buying a new product, we’ve never tested out. Is it going to last for long? We often ask. Good news – you can sleep better at night knowing that canyon comes with a lifetime guarantee. In fact, the lifetime warranty here is the perhaps the best. On the downside, the warranty is limited to some parts only. Ice Retention: their coolers make use of the thick HUNTX foam insulation – which is one of the most impenetrable walls in the market. The rotomolded construction plus the impressive insulation result to longer ice retention that beats the Yeti. According to many cooler tests, the ice performance is up to 8 days! Non-Skid Feet: the canyon has a non –skid feet. With assurances from most users, all those bumpy rides cannot move the cooler from its position. When it comes to cooler design, canyon goes against the trend of using a similar design for their models. If you are the type that will like to rock on a different design, despite the product being from the same company, the canyon is ideal for you. The canyon hard-side coolers come in two models. 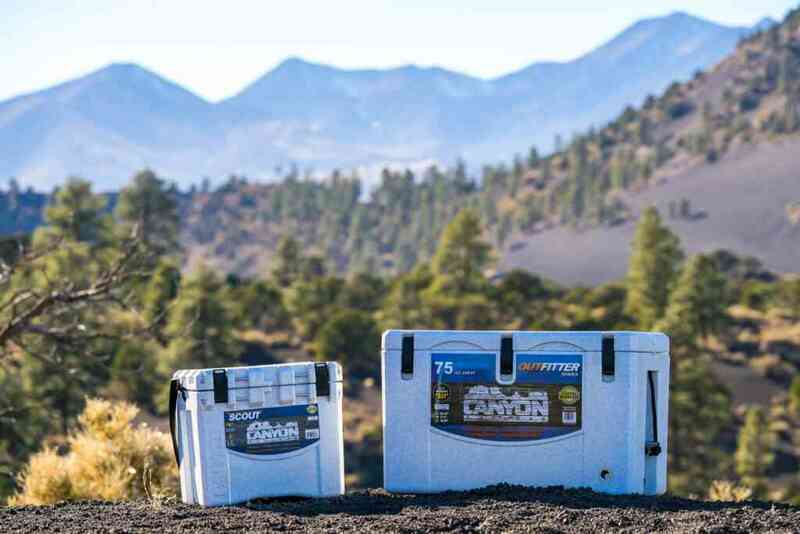 These products are canyon’s top of the line coolers. From the design, you’ll notice the canyon adventure series is set out for a harsh ride. They come in four different sizes of 22-quarts, 30 quarts, 103 quarts and 222 quarts. The canyon adventure is exceptional with its design, as every quart has a unique design. Smallest of them all comes at 22 quarts – features thin insulation walls but still thicker than most regular coolers. Designed with tie-down points, it makes a good boat cooler. The excellent Airtight seal provides extra insulation to keep your stuff cold. For transportation, a nylon strap and built-in lips offer ease. The mule 30-quart and prospector 103-quart coolers are more prominent in size and storage, expect twice and better features. Interestingly, the 30 quart has wheels, an extended handle to cart the cooler and heavy-duty wheels means you can tread on rough terrains. On the other hand, the Prospector 103 does not have wheels, but sports rope handles as the means of transport. Concerning insulation, both the mule 30 and prospector 103 injects up to 2.7-inch-thick walls. The result is an increased ice life with the latter model having more. The biggest cooler here is a Giant sized Prospector cooler at 222-quarts. For the most part, the design is more pronounced, and it features two drain plugs, internal dividers, four latches and promises up to 240 -360 hours of ice. What a beast! 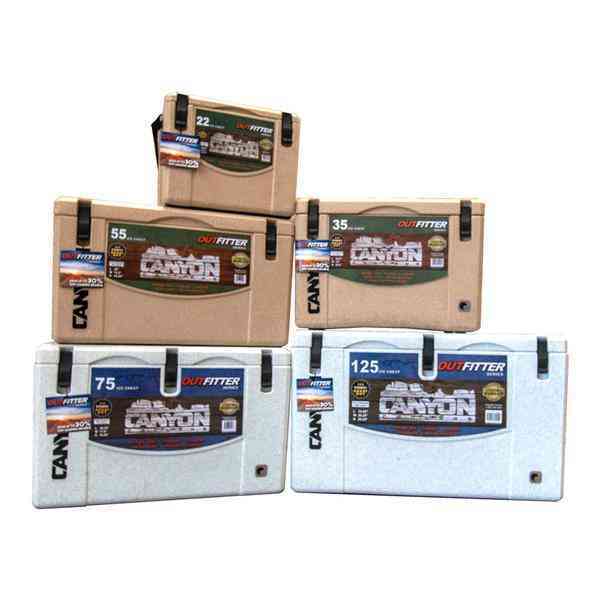 The canyon outfitter as I’ve mentioned earlier is the most popular canyon product. They appear in five different sizes of 22-quarts, 35 quarts, 55-quarts, 75 –quarts and 125-quarts. Unlike the adventure series design, the canyon series model doesn’t look much different. However, there are some minor alterations to the aesthetics. The outfitter models come with EZCAM recessed latches, drain plugs and a no-lose drainage spout. The means of carrying is pretty much the same as the 35, 55, 75, and 125-quart models use rope handles, with the only exception the 22 quarts featuring a nylon strap. Airtight seals secure the base and lid of the cooler; thus, exchange of air between the inside and outside is limited and ice performance increases. The latches differ between the models, the 22, 35, and 55 quarts feature two durable latches, while the 75 and 125 features 3 latches. Regarding insulation, all the models use the HUNTX foam and have thick walls on all sides. Is The Ice Retention The Same? No. In fact, the ice retention leaves a pattern of the bigger, the better. Expect the ice life to be a bit better in any bigger model. 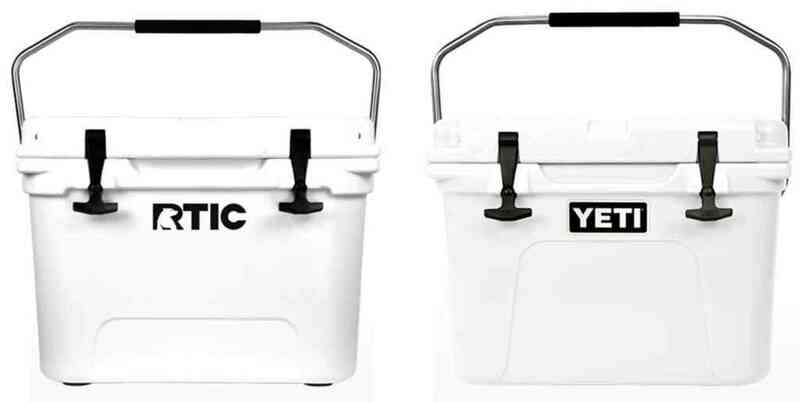 Canyon Coolers vs. Yeti – which is better? Canyon provides one of the best value. 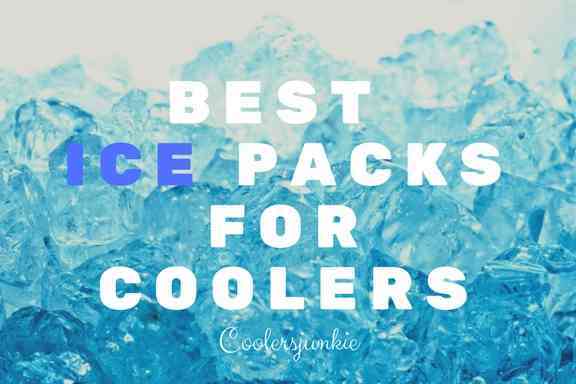 If you intend buying an ice cooler, this is a must read before you do so. How does it compare to the Yeti? There’s only one way to find out. The HUNTX insulation is regarded as one of the thickest. With 2.7-inch walls, the only thing it does better is hold all the cold in. The canyon features an Airtight gasket of premium quality to reduce the exchange of air between the outside and inside. Yeti, on the other hand, features a 2.5 thick insulation wall and a freezer-grade gasket. It’s clear that the Canyon is superior in Insulation and ice retention. Many tests have shown the yeti to hold ice for 5-7 days, while the canyon comes with better ice retention at 6-8 days. Both the Yeti and Canyon come in limited colors. The canyon is available in three outings, White, Aquamarine and my personal favorite the sandstone. Besides, the white color will make an excellent marine cooler; the sandstone will be good for hunting and most outdoor activities. Well, the blue will be good for people of style. The Yeti comes in white, desert tan and blue. All the colors from Canyon and Yeti are essential for different purposes. 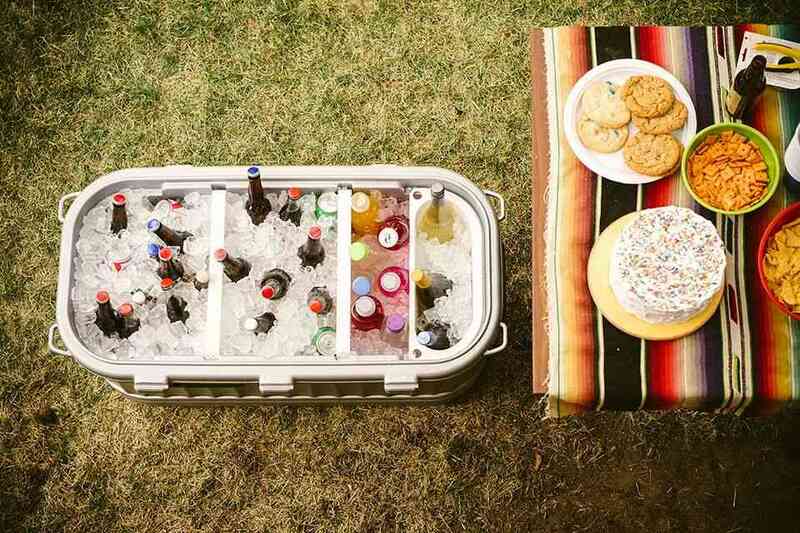 Choose the cooler that’ll fit the activity you are going to use it for. When it comes to design, the Canyon changes design changes for almost every model. Despite the minor alterations, you’ll be able to know a canyon cooler. With a straightforward approach to the design, the aesthetics inclines to functionality over looks. On Yeti’s side, the design is pretty much sleek and perhaps one of the best. The curves and attention to small details made the Yeti the iPhone of coolers. On a final note, the Yeti is more alluring and has the chic to get heads turned. While the Canyon design is pretty much basic, it’s specially made for people that don’t give a darn about looks but functions. The Canyon use nylon rope handles and Yeti follows suit. The canyon adds a recessed handle as a means of transport. 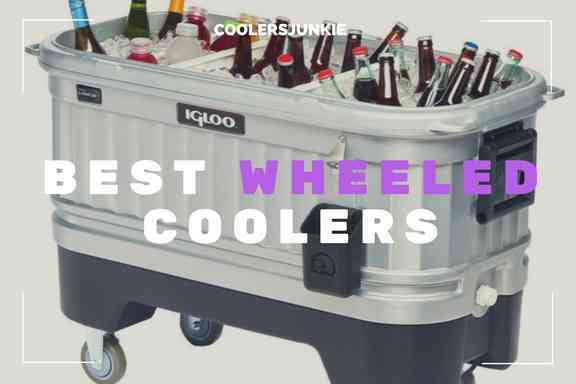 This will come in handy for a single person when carrying the cooler. In this category, I will have to give it up to the canyon for adding a recessed handle. Not only is it useful for a single person but it doesn’t snag even in tight spaces. Well done to the canyon for creating multiple options for carrying. Depending on the style you like best, the canyon handles are there to please you. The canyon latch has a useful mechanism. To lock the cooler, you have to lift the rubber latch over the pin on the lid, the pin hooks the top and pulls down to secure the cooler. As for the Yeti’s T-rex latch system, it’s easy to open but may get cumbersome for people wearing gloves. Although this reason is subjective on which latch system is better, it boils down to preference. If you don’t care about little features like the latch system, then you don’t have much to worry about. When it comes to value for money, canyon provides that, and with higher ice retention and insulation, canyon wins it all here. 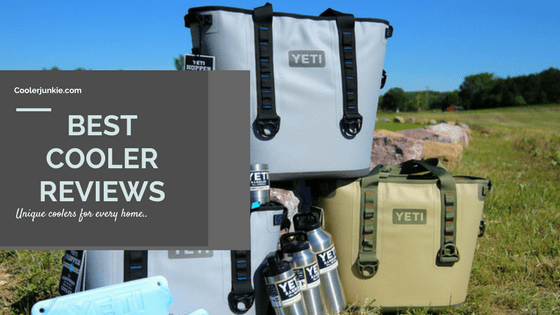 Yeti have attained world following; many people go for their product because they are sure Yeti coolers won’t compromise the quality of their products. With Yeti being more of a trend these days, some people would rather play safe to use a product like Yeti that is recommended and used by many. So, if you are on a budget and you want a similar cooler like Yeti, then the Canyon is one of the best options out there. You have my word! 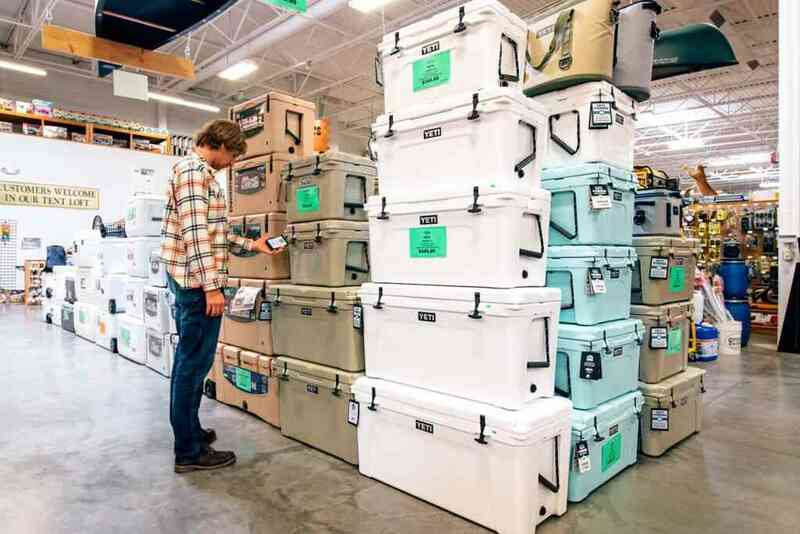 If you expect all the production of both coolers to be 100 percent, I’m sorry, but you’ll be disappointed to know the Canyon and Yeti aren’t entirely manufactured in the USA. Both cooler brands outsource most of their production to other countries. As for Yeti, I’ve made a post on where their coolers and other products are made. The canyon outsources about 80% of their productions, with the coolers being assembled in Thailand and the foam insulation sourced from new jersey and Alabama. If you are the USA product type, I guess you’d be disappointed to find out that both the canyon and yeti outsource their productions to other countries abroad. Canyon coolers can be bought on their official website. Another great alternative is Amazon – they (Amazon) have the best discount prices and offers, so be sure to check them out. Also, the first-hand reviews of users will give you all you need to know before you buy a product. As you can see, the Canyon vs. Yeti debate is all about value. When it comes to value for money the canyon takes it. But a buy for life (BFL) product undoubtedly is Yeti. If you are the type that will love to play it safe with a product, Yeti products have been tested and proven to be top of the line products. Finally, depending on what you like, you should decide for yourself. Again, before we wrap up, Nobody knows what you need better than you. when it comes to ice retention, the canyon wins it. Overall quality, then it is the Yeti. Which is your ideal cooler, let’s know via the comment section below. 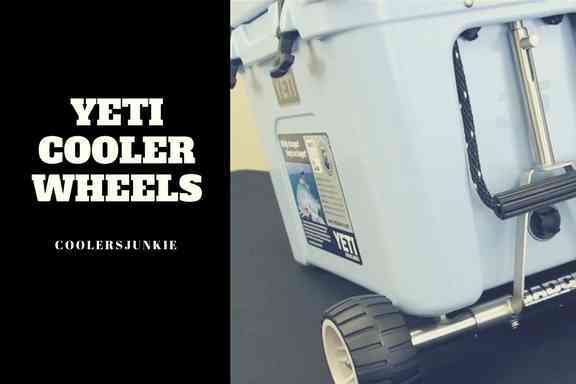 Previous ArticleYeti Coolers On Sale – Everything You need to Know about Yeti Ice Chests! 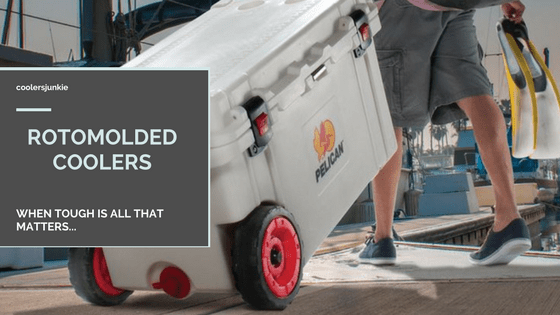 Next ArticleSiberian Coolers On Sale – The Toughest Rotomolded Cooler?